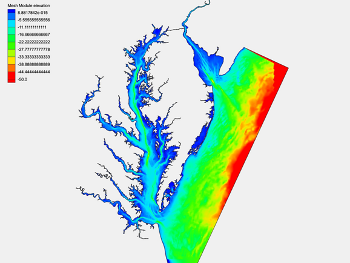 The US Army Corps of Engineers Engineering Research and Development Center (ERDC), in order to simulate circulation and marsh storage in Chesapeake Bay, had a need for a high resolution numerical modeling mesh of the area for their ADH numerical model. ERDC contracted with Aquaveo to develop the mesh using geometric data consisting of eighty-one tiles of digital elevation data containing approximately two billion data points. Aquaveo developed methodology to process and combine these large data files for application in the resulting unstructured grid, or mesh. 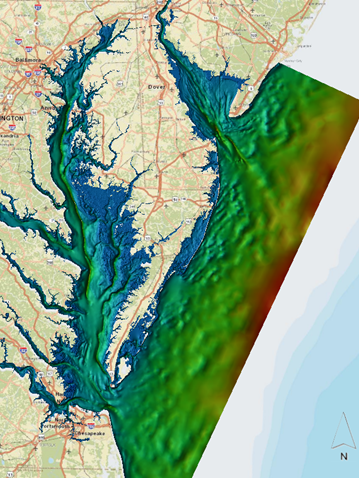 Automated mesh generation techniques were used to create meshes with boundaries at both mean sea level and mean sea level plus one meter to simulate tidal marsh regions. Nodal resolution varied from 10 meters at critical coastal, marsh and channel locations to approximately 20 kilometers at the ocean boundary. The domain included both bays, the C&D canal which connects the bays, and enough ocean domain to contain a minimum of five times the volume of the bays. 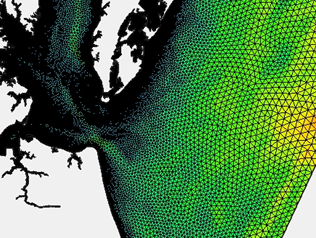 The mesh was used to simulate circulation and marsh storage using the ADH numerical model. Boundary conditions consisted of tidal processes as well as river and stream flow from overland sources. The application was also developed to test the capabilities of the ADH engine and evaluate the computing resources needed for a very large scale analysis. Future applications of this domain will include marsh flushing and storage studies.